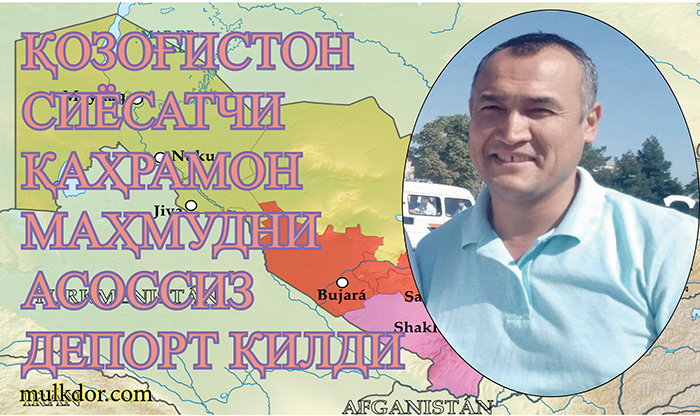 The government of Kazakhstan banned entry to the country for the known politician, leader of the Birdamlik People’s Democratic Party in Uzbekistan Qakharmon Makhmud for 5 years and deported him in absentee state. The politician found out the fact of his deportation from Kazakhstan yesterday on the 5 of December at the passport control shop of the customs office on his way to Shymkent town of Kazakhstan. Before this deportation, politician Qakhramon Makhmud had visited Kazakhstan as a guest to visit sacred places and his friends, entered and left Kazakhstan without any limitations and never violated any internal or foreign policy laws of Kazakhstan. For the first time Qakhramon Makhmud faced the ban on the 11 of November on his way to Shymkent, where he was going to attend the Congress of the Birdamlik People’s Democratic Movement to be held on the 15 of November. On that day the border officials of Kazakhstan did not let him pass the border. The customs officials did not tell him the reasons of the prohibition. For the first few days, Qakhramon Makhmud took this situation as a prohibition against holding the Congress of Birdamlik PDM. For within 11-14 November other activists of Birdamlik faced different obstacles to cross the border. Until 5 of December Qakhramon Makhmud had not known that he had been deported from Kazakhstan. For neither the Kazakh officials, nor any other relevant bodies notified him that he had been deported from Kazakhstan orally or in writing. Today, on the 6 of December, Qakhramon Makhmud went to the Kazakh embassy in Uzbekistan and saw a responsible officer there. But nobody gave any sensible answer to him at the embassy. They said him goodbye by telling him that this may have happened due to some factors like his violation of internal rules during his stay in Kazakhstan, or his deportation from the Russian Federation. However, according to existing laws, if a foreign citizen violates internal laws of the country, where he is staying temporarily or is a tourist, guest, or does something against migration laws, such a foreign citizen is usually deported while his stay in the territory of that country and given an official warning of such act. But while deporting Qakhramon Makhmud, the officials acted totally on the contrary to this, i.e., he was deported before he stepped into the territory of Kazakhstan. We have asked several expert lawyers for consultation on this issue. It turns out that here these actions are done not from Kazakhstan side, but by Uzbekistan. Kazakhstan officials are doing what they are told to do by Uzbekistan. In short, the government of Uzbekistan, its relevant bodies are successfully using the respective official bodies of Kazakhstan. In this way, Uzbekistan remains innocent and Kazakhstan are shown as enemies of democracy. This is not an ordinary case, but we are talking about putting pressure on the leader of the Birdamlik People’s Democratic Party in Uzbekistan, creating obstacles for his free activities in the country, i.e., taking measures to ruin Birdamlik PDP. We think and hope that international organisations, reputable human rights institutions and centres will not be indifferent to known politician Qakhramon Makhmud’s future.